I was sitting in a restaurant in Cartagena, when two guys started talking to me. They asked me which places I plan to go in Colombia and I told them that after my next stop in Medellin, I had no plans so far. They started mentioning Leticia, a city in the Amazonas from where you can take a boat to Peru. It was the first time I heard about it and I immediately fell in love with this idea. I went back to my hostel and started doing some research on it, but there was not a lot of information on the internet. First, I wasn’t sure, if it’s a good idea to go to such an unpopular place just by myself. However, I started getting a feeling that I don’t get that often anymore after traveling a lot: I got nervous, a bit anxious, curious and super exited. So a few days later the decision was made: I would go to the Amazonas!!! I was nervous when I was sitting on the plane in Bogota, waiting for it to depart. I really didn’t know what to expect from the Amazonas. Suddenly, the guy next to me started talking to me and offered me his window seat. Of course, I said yes because I wanted to see the Amazonas from above. This view was better than I ever imagined: the last 30 minutes of the flight, we flew over an endless green landscape with a big river in the middle. This green scenery with countless trees looked like a meadow covered with broccoli. The landscape is so wide; you can’t see the end of it. I can’t even describe it properly; I have never seen something impressive like this before. I was staring out of the window and couldn’t understand what I was seeing, I was totally overwhelmed. 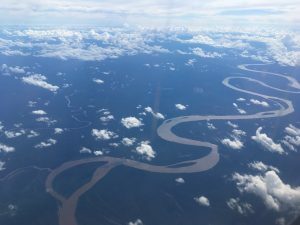 Note: Insist on a window seat, if you fly to the Amazonas! 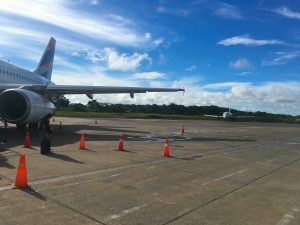 After a two hours’ flight, I arrived in Leticia, the capital of the department of the Amazonas of Colombia. I walked out of the plane and felt immediately a totally different climate: It was hot and very humid. 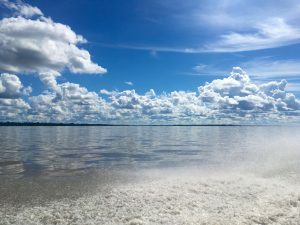 I was so excited when I realized that I was in the Amazonas – a place that I knew from interesting documentaries on TV and I never thought of getting the chance to visit. The guy sitting next to me on the plane told me that he was born in Leticia and is working as a psychologist. He is flying regularly to Bogota to finish his PHD there. When it was time to say good-bye at the luggage pick-up, he offered to show me around in his hometown. For the next two days, he took me to different places in and around Leticia. I was already planning on booking a jungle tour with my hostel when he made a special proposal to me. 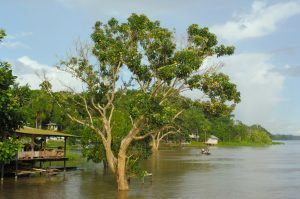 My new local friend has dedicating his PHD thesis to the increasing number of suicides of young Indians in the Amazonas. He told me that there is a high rise in young Indians, some of them only 12 years old, who commit suicide. They get in touch with alcohol and drugs very early, get addicted and cause trouble to their families and communities. I learned, that young Indians often feel disconnected and confused. They feel torn between their origin and culture and the modern world, which they can see on the internet and in the city. They also suffer from discrimination and finding no perspectives in life. My friend wants to find the roots for these suicides, in order to help preventing them. 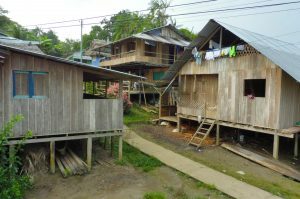 He regularly visits the small towns in the Amazonas to talk to leaders of the tribes (called Curacas), teachers and teenagers, to find out why these problems are occurring recently. He asked me, if I would like to come with him, join such a meeting and visit two towns in the Amazons. I felt honored that he offered me this unique possibility and decided to join. 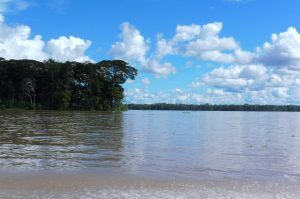 From the port of Leticia, there are small boats leaving a few times daily, which are driving along the river Putumayo and stop at the villages. We were driving on the wide river and the scenery was amazing. We were surrounded by untouched nature, huge trees and an endless rainforest. Like the name rainforest is already indicating: it is always raining somewhere and I could spot a rainbow every day. 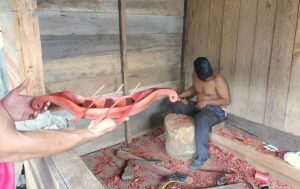 Before going to the Amazonas, I had an imagination of tribes in my head: they are living in little huts in the jungle, wearing self-made clothes and eating food from what nature gives them. I was told that there are still tribes who live like this, but they want to be left alone and are disconnected from the city and government. They live deep in the jungle and regular pubic boats are not going there. What I saw, were small villages, with basic houses made of wood or stone, power poles, electrical devices and antenna systems for TV, radio and internet. Not the latest technologies, but technically surprisingly well equipped. The Indians are dressed like any other people. On the other hand, I saw the locals working with natural materials, doing handcrafts and living in harmony with their environment. I could clearly see the mix of their traditional way of living and the “modern” world that has arrived. We visited a small village, where we met the Curaca of the tribe and the principal of the school. My friend was talking to them about problems with the young Indians. I didn’t participate in the conversation, because I was a guest and I felt honored that I was allowed to be part of this meeting and getting so close to the Indians. They were talking about the problems of drug abuse and the latest suicides of the teenagers. The Curaca had tears in his eyes and was very worried about the kids. They agreed on arranging another meeting with the kids, teenagers and teachers at school to talk about the problems and find a way to help. It is a long-term project, but I really hope that, by working together between the towns, they will find a way to help each other and initiate a program for the young Indians. I am sharing this experience, because I know that this was a unique chance to get in touch with locals, off the typical travel paths. Traveling is not only about exploring places, but also about opening your mind, getting aware of the life and problems of the locals and what moves them. I spend two weeks in the Amazonas, exploring new places, seeing plants, fruits and animals I have never seen before. However, what impressed me the most were the people I met.